Americans are so insecure and frightened about the 21st century. I'm thinking it is mainly Baby Boomers who are so scared about the Internet Age they are attacking the new technology. OK, but now some are even upset about the old technology - - horses and buggies. 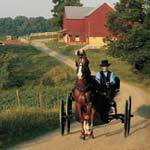 In Loyal, Wisconsin, some of the local citizens are objecting to the horse manure left by the Amish as they come to town to do business. Healthy, natural, horse manure that is also great fertilizer. The story appeared in the New York Times, which also quoted Harvey M. Jacobs, a professor at the University of Wisconsin who studies the Amish. Prof Jacobs' comments are right-on. "The English community (mainstream America) has a number of things they are upset about. The non-Amish community is feeling a sense of alienation, a confusion and anger. These people live amongst us and yet don't live with us. The horse issue is a way that can express itself." Great quote. And of course even more true about the 21st century people living amongst us. Boomers are caught in this new century of new values and attitudes and it's all so confusing.